A Geiger Counter is one of the earliest measurement tools used in quantum mechanics. Understanding how it works sheds light on the problem of measurement. The Geiger counter is a vacuum tube filled with a low-pressure gas that is easily ionized by high energy particles like those emitted in radioactive nuclear decay - alpha particles (Helium nuclei), beta particles (electrons), and gamma rays. 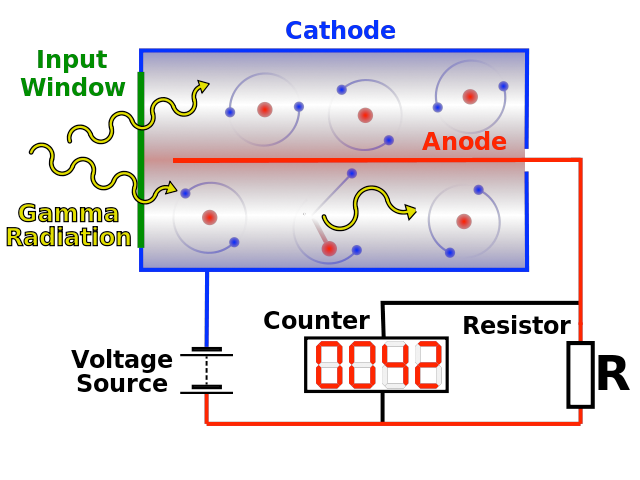 The radiation is sensed when an inert gas (usually helium, neon, or argon) at low pressure conducts electrons from its cathode to its anode when a particle or photon of radiation makes the gas conductive by ionization. The Geiger counter amplifies a single ionization event by means of an avalanche of billions of electrons which appears as an easily measured current pulse. 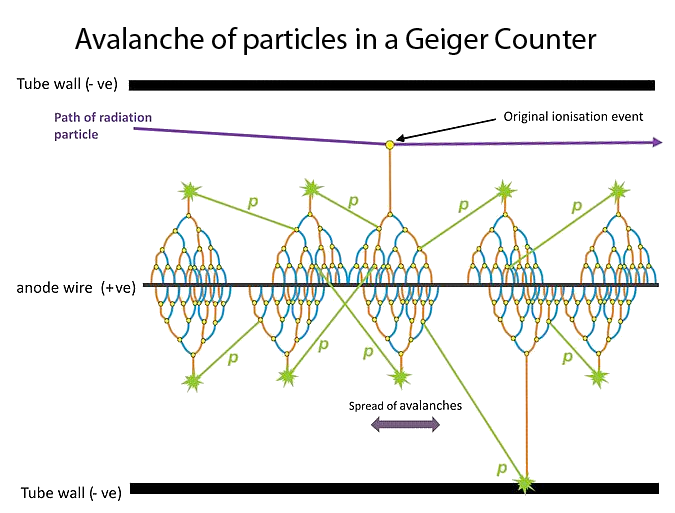 Note that the avalanche dissipates a lot of heat energy, greatly increasing the global entropy, but the measurement of the macroscopic energy pulse also generates a local decrease in entropy - the bit or bits of information about the capture of a particle by the Geiger counter. All quantum measurements that become observations have a three-step character, which begins when the wave function describing a quantum system, evolving deterministically according to the Schrödinger equation, encounters (perhaps becomes entangled with) a measuring apparatus. In standard quantum theory, the first required element is the collapse of the wave-function. This is the Dirac projection postulate, which John von Neumann called Process 1 in any measurement. Note that the collapse might not leave a determinate record. If nothing in the environment is macroscopically affected so as to leave an indelible record of the collapse, we can say that no information about the collapse is created. The overwhelming fraction of collapses are of this kind. Moreover, information might actually be destroyed. For example, collisions between atoms or molecules in a gas that erase past information about their paths. If the collapse occurs when the quantum system is entangled with a macroscopic measurement apparatus, a well-designed apparatus will also "collapse" into a correlated "pointer" state that can be seen by an observer as new information. The Geiger counter produces that observable information in the form of the macroscopic electric current pulse. This is the second required element - a determinate record of the event. Note this is impossible without an irreversible thermodynamic process that involves: a) the creation of at least one bit of new information (negative entropy) and b) the transfer away from the measuring apparatus of an amount of positive entropy (generally much, much) greater than the information created. In a primitive Geiger counter, an audible beep may sound. In a more sophisticated unit, the digital display is incremented. Finally, the third required element is that the indelible determinate record is looked at by an observer, presumably conscious, although the consciousness itself has nothing to do with the measurement (despite von Neumann's puzzling about some kind of "psycho-physical parallelism").